Gerry Anderson, creator of a myriad of great British television series (and even the "bad" ones, I've discovered thanks to DVD, are actually not that bad either) was buried last Friday. 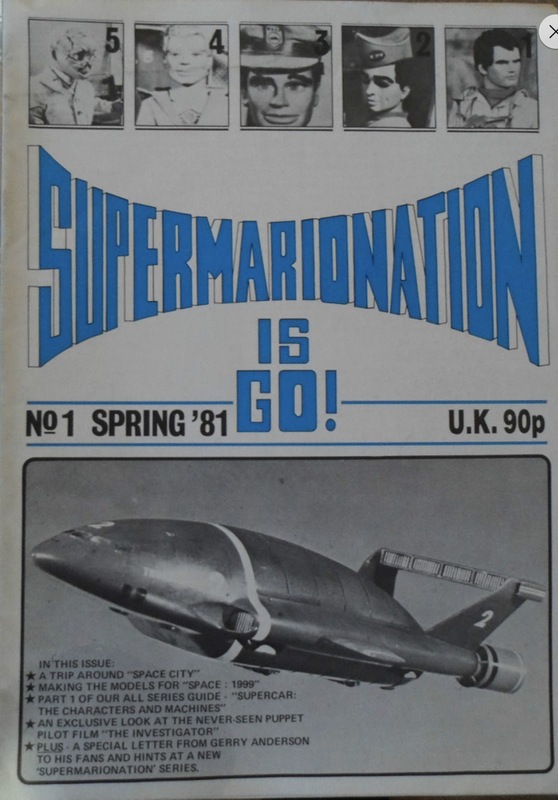 To mark his passing, this is the first issue of the long-running (it survives today - several incarnations later - as the newsletter of Fanderson, the official Gerry Anderson fan club) fanzine S.I.G, published in the spring of 1981. The first few issues appeared as SUPERMARIONATION IS GO! before the title was simplified to S.I.G (a name which also better reflected the range of Anderson's output including live-action film and television). Production standards on the A4 professional-fanzine improved considerable from these humble beginnings: colour covers were latterly introduced along with a bolstered page count. I never owned this particular issue, the first two I ever bought (three and four, I think) came from London's Forbidden Planet 2 and I bought them because they contained a two-part feature on the comic TV21, an exciting-sounding comic from (to me) pre-history. I didn't join Fanderson for another few decades (their newsletter is now a lovely A5 glossy affair) but I did pick up a number of later issues of S.I.G because it remained available to casual readers via specialist shops as well as club members (the modern version has a strictly-for-members distribution list).